"HAVE YOU EVER KILLED ANYONE? HAVE YOU EVER KILLED ANYONE?....I HAVE" bellowed the gravely-voiced passenger from one of the city bus's raised seats. We and all of the other riders stiffened and fixed our gaze on the nothingness straight ahead of us. The mantra "HAVE YOU EVER KILLED ANYONE?" was repeated over and over by the man whose light grey hair and beard would have looked fine framed by a Santa suit. Slowly we learned more than we wanted to know as his loud voice with a flat affect added "Nam. It was Vietnam. I didn't want to kill anybody but I did. HAVE YOU EVER KILLED ANYONE?" After 10 years of making our annual trek back to the US for a few months, assaults like this on our senses have gotten harder instead of easier to shrug off. The weirdness of having the world we left behind change while we were away has softened and we've learned to take those welcome and unwelcome surprises in our stride. But it is this immersion in craziness and extremes with which we don't cope well. The literal madness on the buses and light rail is the most intrusive that we experience, like with this deeply troubled veteran whose stresses bubbled over and on to all of us. And we heard more than we wanted from a string of others too, like the man who was coercing his girlfriend into collaborating with him to elude his parole officer and the slightly retarded, youngish woman who was at risk of having her foot amputated because of complications from adult onset diabetes. More than once we concluded that we were about the only normal-functioning riders on a nearly full bus. Some days it was 2 to 3 hours of commuting in this toxic environment that made us wonder how deeply the experiences were eroding our beings. Our commuting time often felt like a toxic bath but trying to feed ourselves on the fly a couple of times made us feel like we were risking a toxic ingestion as well. During the first couple of days back home the unfortunate combination of not fully restocking our pantry and not mastering our time management had us hungry while out and about. We ducked into a Food Court at the downtown mall and concluded that there wasn't a suitable snack there that wouldn't independently devour our sodium or added-sugar budget for the day, so we pressed on with our errands as hypoglycemia compounded the ill-effects of jet lag. Once we arrived at the grocery store, we still struggled to assemble a hearty snack that would be nutritious and give us the 'clean' calories we needed. As though on a life and death mission, we split-up to scout different areas of the store, furiously reading labels hoping to find something that would sustain us through our marketing and the bus trip home. Finally we compromised and bought prepackaged protein shakes as our best choice. The hunter-gatherer-like experiences at the mall Food Court and the supermarket combined to add weight to the expanding awareness of how little nourishing, ready-to-eat food is available in the US aside from that which gets processed in one's own kitchen. When taking the long way to an appointment for the extra exercise during our chilly first week back home I intentionally cut-through Nordstrom's department store for a little eye candy. I shielded my eyes from the surreal madness at the newly renovated cosmetic counters and headed for the back corner to the accessories--the sensibly priced socks, scarves, and hair ornaments. To my shock, the sensible corner on the ground floor had morphed into a monstrosity of blingy, oversized handbags and scarves that were discounted to a mere $100. My sense of having fallen into another Alice in Wonderland bit of madness was only worsened at Nordstrom's when I darted past the outrageous women's high heels that would have been engrossing in an art exhibit but looked like a nightmare to wear for any woman with regard for her anatomy. All of those aberrations were too much after having just been told at the outdoor store that my search for a black wicking turtleneck shirt was futile--turtlenecks were out. "Huh? Turtlenecks in sports fabrics are out? When did that happen?" Crazy people on the buses and sidewalks; non-food food filling the stores; bizarre shoes being promoted as footwear; seemingly outrageous prices on food and clothes; and the onslaught of advertising for endless, low-utility 'stuff' had us wondering what had become of home; what had become of us. It is the necessary adjustment to these urban realties after months of riding our bikes and hiking in rural spaces that is hard for us when we come home. It is the need to be constantly centering ourselves on multiple scales and continuums that has us reeling for weeks after our return. The difficult recalibration process reminded us that part of what we treasured about our lifestyle of cyclotouring was letting the environment reset us, letting it re-center us. We can be a little out of sorts and after minutes of pedaling in the fresh air surrounded by even a bit of nature we'll feel better, we'll feel whole again. In contrast, stepping out into the urban environment back home whipsaws us from one bizarre sensory extreme to another and rattles us to our cores. Our sense of wholeness is shattered and the process of reassembling it multiple times a day has us asking questions that seem to have no answers. Being back home quickly had us in a state of shock from learning too much about strangers but some years, like this one, I also learn an amusing bit about how others view me. One morning Bill looked up from his computer and announced that we were now in the category of people known as "cable-cutters". Cable-cutters? Immediately I strung it together with other labels that professionals had given to us, making me "An un-churched, cable-cutting, deadbeat." Cutting other cables with rabbit ears. I think it was the Catholic bishops from Chicago that came to Oregon some years ago to fight the state's death with dignity law who attempted to shame the local citizenry by labeling the state as being "un-churched." I liked the catchy label and have used it ever since as a handy reply when asked my religious affiliation. 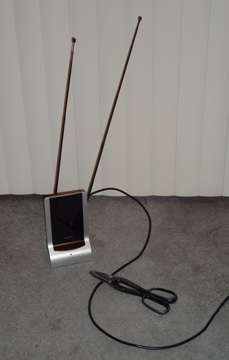 Our latest moniker, "cable cutters," referred to another form of abstinence, which was from paying satellite or cable TV services--we miserly use rabbit ears on our new little TV and search the internet for our other sources of news. "Deadbeats" was the most amazing label given to us and our fellow, tight-fisted credit card users that never carry over a balance and therefore don't pay interest or services charges. Our strategy is excellent for our credit rating but is bad for their bottom line hence, we are deadbeats in the eyes of the credit card providers. I amused myself on the bus one day by pondering what labels other professionals might have for us as I only learn of a new label every few years. "Stream diverters" was the best I could conjure as coming from investment service providers--providers that we resist in letting divert our income stream towards by not buying their services. Perhaps we'd be known as "fussy eaters" among medical professionals exasperated with patients like us that pick and choose which east and west treatment approaches we will use: "a little acupuncture here; a dose of prescription medication there." Not quite a month later, I was briefly labeled as a "non-adapter" because my new lenses made for my glasses were terribly blurry. For a while my difficulties were pinned on me for being unable to make the shift from plastic to less-sharp polycarbonate lenses but then another cause for the problem was identified. So briefly I became a "non-adapting, un-churched, cable-cutting deadbeat," but then I had to give-back the 'non-adapting' label. 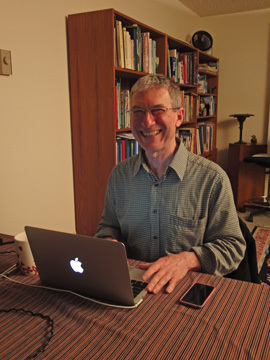 After more than 30 years of being an exclusively IBM-based PC household, in an almost impulsive gesture, Bill bought his first Apple laptop just before New Year's Day and another industry-applied label was surely earned--we just don't know what it was. Bill's months of research to determine the best new PC laptop for us had left him with no happy choice. "Trade-offs" had increasingly been rolling off of his frowning lips as he struggled to find the most acceptable compromise between size, weight, speed, function, durability, and screen quality. Successive products had come close to being purchased and at the last minute, disqualified themselves as too unacceptable for the amount of money involved. After yet another foiled attempt to find and buy the most suitable machine, he strolled down the Mac aisle at Best Buy and one of those brilliant little glass screens winked at him. It was the marginal screen quality in the smaller PC laptops that had been the deal-breaker as we needed a sharp screen for working with our photos. And there it was: the perfect little package in Mac clothes. It had the low weight/size profile we craved for travel; acceptable though not stunning speed; and a competitive price--the problem was the Mac clothes. We were PC users and all of our software was for the PC. Extreme dissatisfaction with the 2010 Christmas buying season PC's wedged-open a crack in the part of Bill's mind that had ruled-out Mac's as an option and he made a trip to the Apple store to pick the brains of the one pro in the sea of smiling young faces in matching T-shirts. The sales pitch worked and he walked out with quickly named "Slick" under his arm (known as an 11" MacBook Air to the rest of the world). Sitting across from each other at our narrow, pressed-paper dining/office table top while working on dueling laptops as we do for hours on many days, I watched the smile grow larger and larger on Bill's face as he explored Slick's capabilities. Factory-fresh Slick with few installed programs ran circles around our other 2 laptops that had become bogged down and encumbered with heavy demands. "Booting time" would be dropping out of our vocabulary as Slick was waiting to please as the screen was lifted to the ready position. Not having to solve the nasty technical issues myself, my only question to Bill was "How long before you buy one for yourself?" 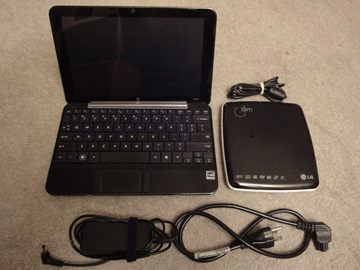 Slick was bought for me; Bill had planned on using our heftier Dell laptop "Baby" for another 2 years but bulky, aging Baby was suddenly looking like a short-timer. 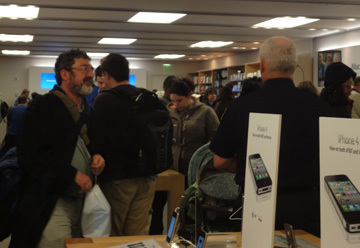 Unlike Bill's triumphant first visit to the Apple Store, my first visit alone had me feeling old and out of touch among all the smiling faces in matching T-shirts fringed by massive tattoos and disturbing piercings. Slick was my computer and after a weekend at home with us, I was to drop him off, along with our HP notebook that was being retired, to have the data transferred from the old machine to the new. But as the minutes in the oppressively stuffy and noisy store clicked their way to close to an hour, my ‘shock & awe’ at the Apple scene shifted from intimidation to disillusionment. Unexpectedly, my sense of being old and outdated slipped closer to a slightly superior feeling because I realized I was lucky, I hadn’t evolved as far: unlike the young Apple techies, I still had the use of my opposing thumbs. It was hard to hear, think, or even move at the Apple store. The Apple store was packed with hip but earnest young faces all framed by identical, unaltered red T-shirts. The first took my name and used his forefinger and deep concentration to slowly enter "Barb" and a little description of my needs into his i-Pad. I was then instructed to slither through the press of people to the other end of the store and locate the red-shirted fellow with a cap, who then instructed me to wait for 20 minutes. I protested slightly and said that I’d go run an errand. He countered, saying that I mustn’t. “See you later” was my response and indeed I hadn’t lost my place in queue when I returned with my time-slicing mission accomplished. My 20 minute wait was for the privilege of having another red shirt introduce himself, shake my hand, and tell me sit until the 4th red shirt was available to help me. #4 heard the often shouted phrase “I’m dropping off these 2 computers for a data transfer.” #4 couldn’t help me either but someone from the back would be summoned who could do the job. #4 emerged from the back room alone, ignored me, verbally tussled with another red shirt, and then escorted me to yet another waiting station. “Wait here” he instructed as he went off. I was slowly being maneuvered towards the door, the door I wished I had exited through a half hour earlier to eat my lunch and begin my cross-town walk, when red shirt #5 introduced herself. Later I would know that I had reached my final station and my final red shirt, but it was the beginning of a string of devices, not people. Cynthia slowly keyed in all of my relevant ID and contact information into another i-Device using only her forefinger and a riveted gaze as I shouted answers to her questions over the din of multiple concurrent conversations. But she and her i-Whatever weren’t in harmony as she slowly and systematically re-entered the information each time her device rejected it. While she was in the backroom getting a second entry device, I wrote the missing bits of information on the summary sheet Bill had prepared for us to get me out of the exasperating triangle with her and her i-Thing. Now it would be between her, her device, and my sheet of paper as I watched. I tried not to sound rude as I asked “Can’t you use that screen as a thumb board?” as she slowly poked the information in over and over again with her hesitating forefinger and locked-on stare at the display. It was possible, but not for her, was her response. Suddenly I felt wildly superior with my old technology PDA with a physical key pad. I’d ‘thumbed in’ tens of thousands of characters over the years into my history files at lightning speed compared to what she was able to do with her single forefinger a third the age of mine and her state-of-the-art gizmo. As Cynthia consulted with yet another red shirt and fetched a third device from the back room, I realized that everyone of these techno-wizards was operating at less than half speed: their slick new i-Pads and i-Whatevers were clumsily operated with a single forefinger. My respect for Apple plummeted: they’d produced innovative, state-of-the-art handhelds that were fun but that didn’t interface well with humans. I thought of my technology bias towards physical keyboards on my PDA and laptop and realized that they were designed for work. Those screen/keyboard formats allow the user to look up and around at things and people while both hands actively contribute to output. In contrast, i-Users eyes were riveted to their little screens while using a single forefinger like they were going to poke an eye out, totally ignoring the customer in their techno-trance. “What a sham. It’s all cult and hype” was all I could think as my patience wore thin. And what a horrific introduction to their newest products: to see them bomb as they tried and failed to use them as business tool in their retail stores. Still with time on my idle hands, I recalled the recent international news coverage about the release of the then-new i-Pad and remembered how it resembled a Harry Potter book release—all hype and little substance. I was stunned when one of the TV tech reviewers felt the same way about the product itself: he referred to the i-Pad as a cool toy but not much more. “A toy? It’s just a toy?” I thought. I assumed it was a serious business tool. I knew Apple was a ground-breaker in the realm of music and phones and took it for granted that it was still a legitimate player in the business tools industry, not just entertainment. I rolled my eyes when Cynthia finally found someone in the sea of red shirts who could tell her that she was missing a key piece of information—that it wasn’t the devices that were failing after all. But even he only came up with solution after attempting to solve the problem by circumventing their store system by using my i-Tunes account, of which I had none. So, once again Cynthia poked away with her forefinger, entering the same 6 lines of information again. Finally my 2 computers were taken to the back room. Amazingly, after all of her efforts at data entry, the print-out that emerged from behind the closed door for me to sign lacked the area code for my phone number and the second of 2 needed passwords. Cynthia had apparently noticed those glitches too and promised to take care of them but in my eyes it was another glaring failure for effective business operations—the toys were taking over and from what I’d seen demonstrated, looked like they'd sink a less formidable business. Unfortunately, extracting our 2 computers from their crazy system took days longer than was promised and was only achieved after threatening to go behind the closed door myself and kidnap them--I wasn't going to play musical chairs at the Apple store again. We immediately loved Slick but we weren't too keen on his clan, despite their tirelessly cheery smiles and ready handshakes. The winter of 2010/2011 yielded a bumper crop of new and revived toys for us, with Slick quickly distinguishing himself as more than just another toy from Apple. The first real toy purchase was made when following through on a promise to ourselves to buy a slackline like the one's we'd tried in Austria in the summer. 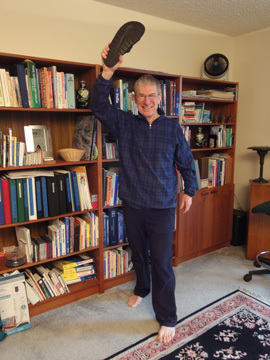 Then, while getting permission from the manager to use our slackline on the apartment complex property, the maintenance man (who was a passionate rock climber) described a companion piece of equipment, a balance board. "Taa-daa" playing on our new balance board. We couldn't readily find the recommended old skateboard deck to put with a length of 4" PVC, so Bill compromised and brought home a 2' long piece of plywood and a 3" diameter PVC pipe to get us jump started. Exhilarating and challenging, the makeshift balance board was an instant success as we could use it in our little living room when the weather was too harsh to use the slackline (though we did set-up the slackline above frozen ground one day.) 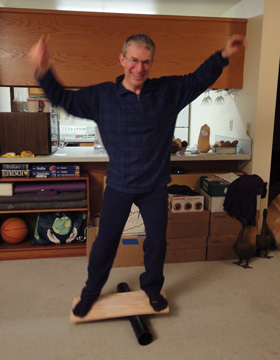 Even a few minutes on the balance board was enough to clear the mind and activate all of the lower body muscles. Reading a new online tip on hula hooping inspired us to give it a try again. I also read that we had an uphill battle before us as I had unwittingly bought a kid-sized hoop years ago, which makes it harder to propel the hoop. Rather than replace it, we vowed to focus on the benefits of the process of trying to keep the hoop going rather than becoming proficient. I also bought a bottom-end heart rate monitor so we could begin equating our level of effort when biking with hiking. Everyday I checked for the prospect of snow so as to break-in our new cheepy snowshoe shoes. I wasn't keen on renting a car for our first outing which seemed like should be limited to a half an hour or so if we wanted to be able to walk the following day, but the below-freezing temps were always accompanied by dry weather. We treasured those dry days for bike rides and hoped for snow soon for our languishing snowshoes though it never came. Then we noticed that jump rope we had hauled with us for several years while cyclotouring abroad still wasn't in hot demand. Being in easy reach on an interior door knob hadn't been enough for it to see some action. It was deciding it should accompany us on a trip to the garbage/recycling bins that tipped the balance as by draping it around the neck, it would be ready for a few licks on the way back inside. When you live in a small space, you can't be bringing new things home without other things going out the door. So for me, it seemed that the time was right this winter to again severely cull our belongings but for Bill, it was the prospect of moving my 94 year old mother from her studio apartment that made it easier for him to make those hard personal decisions. Sold! Little Brother didn't survive this year's cull. Mom had downsized herself to fit into an assisted living studio apartment but even that amount of stuff was going to be too much when we moved her into a 12' x 12' room in adult foster care home. She was far from being a hoarder but nonetheless, seeing the product of her diminishing aggressiveness in resolving the "keep/save" dilemma gave Bill a new clarity about the wisdom of culling his possessions boldly and often. For me, it had felt more incremental. This would be our second full winter season stay in our new apartment and I was more confident about where to draw the line when encountering old stuff. "I might use it" wasn't good enough anymore; "Will it be used or not?" was the question. Several boxes designated as "Memorabilia" had a temporary reprieve, but everything else that passed through my hands got a long second look before going back into a box, closet, or drawer. The big ceramic mixing bowl for making crusts for 2, two-crusted pies went out the door as did those hard-to-maintain cloth placements and napkins. Our set of a half-dozen tie-downs for a truck were given to a friend who had more immediate use for them and bags and bags of other items were given to a charity. We were committed to "living big in a small space" the rest of our lives and the sooner our pile of stuff matched the size of our abode, the better off we'd be. The ongoing challenges of managing belongings spurred me to formulate new criteria, new guidelines to help us re-wire our saving habits. "Good stewardship of objects" was a slogan we borrowed and employed 11 years ago when we prepared to move out of our home to travel. It had served us well but now it was inadequate guidance; we needed more motivation than that provided to cut deeper into our stash. At last, my very own rock box to play in. "Assign an Expiration Date" was a new strategy that I devised this year. It emerged while considering the cost/benefit of fitness equipment I was accumulating. Five dollars was the admission price to our local public Rec Center and I decided that $5 was a good price point for establishing the pay-back on purchased equipment. The $14 we spent to assemble a balance board from a stab of plywood and a piece of PVC would meet the pay-back criteria if we got a good workout or novel bit of skill-building from the set-up 3 times--equal in benefit to 3 visits to the Rec Center. If we lost interest in the balance board and we'd used it 3 times, it was a no-brainer: it could be moved on guilt-free rather than shamefully stuffed into the crowded closet. 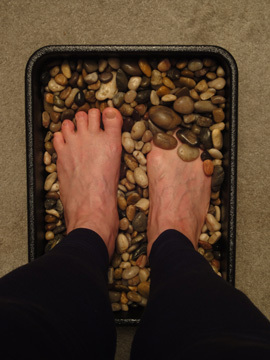 Likewise, the $4 expense for rocks in my foot stimulating 'rock box' could graciously 'expire' after a single use. Not a perfect remedy for nudging all objects no longer used out the door, but having a way to assign value or 'return' to items was a way to stream line the ejection decision in the future. "Honor the intention of the gift or purchase, not the object" was another new coping strategy. As in "I bought the item to rehab my shoulder and that has been accomplished so I don't need to keep it." "The gift was given to include us in the celebration, which it did. We don't need to keep it forever." Both of us are too quick to believe that we must treasure forever anything that was given to us, which tends to bury us in too much stuff. Despite the earlier promise of a reprieve, one day I took on my memorabilia boxes, vowing to release the monsters hiding in the dark boxes and rehabilitate them into something positive again or out they would go. Links to my childhood, to who I was, were nourishing and broadening, but they also had to be uplifting and not too numerous to be retained. It also became clear that memorabilia needed to fill a virtual cornucopia, with the most recent items spilling out of a broad front and the ancient ones being confined to an increasingly narrow tail. Just saving reminders of the path I had traveled in never-opened boxes was looking foolish. I vowed to cull them and open each box, perhaps on New Year's Day, as an annual ritual of honoring my past. 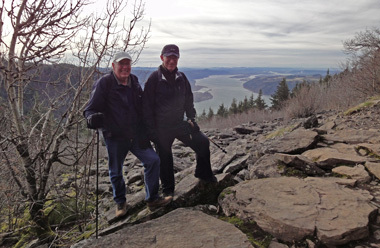 Time Out: Our friend Larry took us for a hike in the Gorge. The tone or feel of each winter at home is always different and this year was no exception. The start was rough as we felt jarred by the crazy people on the streets and by the distorted products on the shelves. But as the weeks rolled by we found ways to navigate around them and became less reactive. And compared to other years that felt like managed chaos, this year's stay at home had a relatively orderly feeling about it. I bit the bullet and paid the premium to take the express bus between Portland and Vancouver when I could. It's higher price was OK but its restricted schedule and the 1 hour round-trip walk to and from it added to the planning challenges. But during non-rush hour periods it reduced my time spent on the big wheels by about 75% and surrounded me with a higher functioning group of passengers. Fortunately, there were no worrisome findings at the doctor's offices and our dentists didn't come up with any expensive bad news this year. We resisted time consuming classes like Italian language courses or motorcycle endorsement workshops of prior years that compressed our time even further and there were no upheavals like the recent unexpected move. The good news/bad news for me with my 94 year old mother's plummeting health was that her move into an adult foster care home occurred when we planned to be at home. 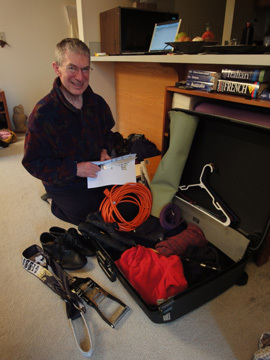 I had presumed that my greatest gift to her at this stage in her life was to assist her in further downsizing her belongings and supporting her in her move, which by chance, neatly fit into our travel schedule. Our "traveler's apartment" was finally presentable & serviceable. 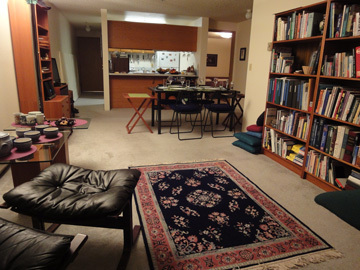 Further settling into our 'travelers apartment' was a met goal for the winter of 2010/11. The last of the boxes stacked in the living/dining area (though not the last of the unpacked boxes) were dispatched and the framed artwork that we'd lost interest in over the last 10 years was hung anyway to give the place a more finished look. Making it comfortable, making it feel complete, was more important than having it reflect our current tastes. In the spirit of finding pleasure in the tourist apartments we rent for a week or 2 at a time when overseas, this apartment needed to be pleasant--it didn't need to be "us." We added a couple of folding chairs and cushions for them, bought some contemporary placements on sale, and declared ourselves ready to reciprocate with friends who had had us to their homes over these last 10 years. It was sort of a coming-out event: we'd shown ourselves to the world as travelers for years, now we'd show ourselves 'living small' to our community. Some friends were taken aback and labeled our compressed living quarters as "being like back in college" and others embraced it as a fair compromise for travelers. But regardless of the reactions of others, we enjoyed beginning to share the space we'd carved out of the rubble for ourselves with others. 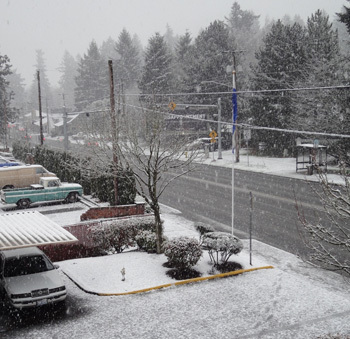 Out our window: some snow & a lot of rain this winter in 'couv. Riding our bikes became more systemized in 2011 than before and Bill's rented downtown Portland bike locker was a part of that new routine. Little over an hour ride from our apartment, it was comparable to the more efficient public transportation options for commuting. Though not suited for every trip into town, one of us used it about once a week. Bill turned my rather dreary urban streets route to Vancouver's Trader Joe's market into a scenic training ride. I'd been taking the shortest bike route there but Bill cleverly included a big hill and a long traverse through a developed wetlands area. His route was the kind of ride I can do many times without being bored as each of its many segments is different and each segment evokes a different persona. The tight curves as the trail rolls up and down along a creek test my nerves like a mountain biker on a single track; stretches alongside fast moving highway traffic narrow my visual focus to pavement hazards while amplifying my attention to critical changes in auditory cues from the traffic noises. The out-of-traffic traverses on the multi-use trail far from the cars allow us to sit-up, relax, and chat. Then there is the vigorous climb up the one big hill and the effort to take our heart rates higher than the last time up it--such diversity keeps it interesting week after week. Many of Bill’s winter’s at home have been marred by injuries that sidelined him but this was the year for him to succeed in being active in the off season. Often it was a combination of serious ‘reorganizing’ of his back by our sport’s massage therapist and knee injuries sustained while on his back-home bike that hobbled him. But his heightened commitment to focused daily stretching had helped him turn the corner on his back issues and his equal commitment to solving his bike-fit problems also paid big dividends. So effective was his increased commitment that he exceeded his targeted riding distance by 30%: he achieved 700 km (435 miles) during our 10 week stay rather than the 500 km (311 miles) he’d hoped for. Many years he had to eliminate most walking and rely heavily on the bus for doing errands because he was so incapacitated. It was resuming work on our unfinished 2008 photo album on New Year's Day that threw me into my deepest grief over our lost lifestyle of traveling for 9 months at a time in Europe each year. Flipping through older, completed albums had filled me with joy at what we had seen, with what we had experienced. But holding each unplaced 2008 photo in my hand was different. The trivial physical weight of each photo seem to phenomenally amplify the emotional weight of realizing "I'll never see this again." It felt like a part of me was dying as I made that realization over and over again as we approached the end of the album. Even though our status had not yet been determined by the Spanish authorities, at some point in the near or distant future, we could go back to anywhere that we wanted. But complying with the effective 3 month traveling season limit each year meant that there never would be time to revisit everything we've seen over the last 10 years. In reality, there are many places that I wouldn't bother with a second time, but it was the loss of sense of choice that I began grieving; the loss of being able to wander and linger and roll with what happens that was painful. Complying with the 3 month visa restriction will force us to be more purposeful, more focused, more directed. We'll be on more of a tourist mission of "A List" experiences and destinations instead of traveling continuing to be a lifestyle. 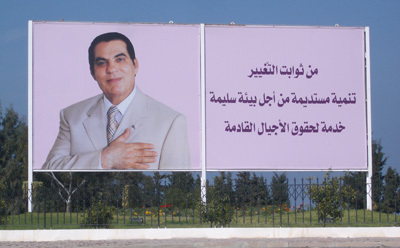 Tunisia's President Ben Ali sweetening his image in 2008. The loss of our chosen way of life was of course small on the scale of losses people experience and we were careful to keep that in mind. But not yet having crafted a new direction, a new plan, left us at loose ends and magnified the sense of distress. The end of our stay at home was punctuated by the exciting political upheavals in Tunisia and then in Egypt. We had visited both countries and had felt the constraints of their dictators even as guests. Watching the men scatter as the police rolled through the big park in the capital city of Tunis was something we'd only seen in Italy when the North African street vendors spotted the police but in Italy it looked like a less dangerous game of cat-and-mouse. We were aware that the deliberately slowed internet speed in Tunisia was an effort by the government to keep a lid on things and resented the inconvenience and were appalled at the greater implications. And the pink billboard backgrounds of a smiling Ben Ali were a too-obvious gesture towards softening the brutal image the Tunisian president had earned. In sympathy with the Egyptian protesters. Seeing the dramatic changes unfold and the ones that followed elsewhere in North Africa deepened our appreciation for the privilege of having traveled so far, of having experienced so much. Our North African journeys weren't fun or pleasurable but they were fascinating and deeply enhanced our understanding of the world in ways that are hard to achieve without being there. It was a timely reminder of the potency of travel as the prospect of crafting a new lifestyle would likely have us spending more time in the US; it was a reminder that we should continue to make a point to travel internationally each year to keep our expanded perspective from shrinking too fast. Packing for Vegas: different than for Europe. Almost too soon, it was time for us to close our traveler's apartment again so as to catch a domestic flight to Las Vegas for a new adventure: 2 months in a rented RV. Bill had planned this late winter hiking trip in hopes of keeping our fitness level high without having to bike in the dreary winter weather of the US or Europe. It was a grand experiment and we hoped for the best. Driving a hulky RV, dodging rattlesnakes, and escaping severe weather were the anticipated challenges but of course, there would be all of those unanticipated obstacles to overcome too. We are 6 weeks into our 8+ week trip of traveling the US southwest in a rented RV. As planned, it has been a hiking trip rather than a road trip, which is a good thing. We quickly learned that our tolerance for driving this behemoth is about 100 miles in a day, which we don't do often. It's been colder than we'd prefer, with many nights below or near freezing, both indoors and out. But the sun has shone absolutely everyday and all day most days, which is blissful. We are loving the sense of almost living outdoors, but with the comforts of a cozy bed, a refrigerator, running water, and sometimes heat. Learning to cope with the crackly dry skin from humidity in the teens is a new challenge for soggy, Pacific Northwester's. We've hiked 6+ days per week, which counts as a rip-roaring success for meeting the trip's objectives. We are on high alert for rattlesnakes day and night but so far have only terrified 1 garter snake (we think). Mule deer, a few bunnies, and a lot of chipmunks are the limit of the other sightings. We've enjoyed the pleasant ambiance created by dozens of nice people in the RV parks and wilderness campgrounds. These snowbirder's are a contented crowd and it shows. Tomorrow we literally turn the corner and start heading towards Las Vegas to return our rented rig though we are in no hurry to give it back. But rental agreements and prepaid air tickets to Portland will keep us on task. We are still in limbo with regards to be welcomed back into the EU though we think we've finally connected with someone in the Netherlands who will tell us "Yea or Nay." I'm optimistically predicting that we'll have an answer in a week or so, which would be a huge relief. The uncertainty as to how or when we'll be able to retrieve our bikes and gear that are stored in Vienna is challenging to live with, not to mention putting our lives on hold. The late winter storms almost everywhere have made life challenging for many. We hope you've been surviving in style and have grabbed your share of fun along the way.